Astronomers have increased the size of the observable solar system after spotting a 450-km wide object orbiting the sun. The lump of ice and rock circles the sun at a greater distance than any known object, and never gets closer than 12bn kilometres – 80 times the distance from Earth to the sun. If its size is confirmed it could qualify as a dwarf planet in the same category as Pluto. Researchers said the discovery proves the existence of the inner Oort cloud, a region of icy bodies that lies far beyond the orbit of Neptune – which at 4.5bn kilometres from the sun is the most remote planet in the solar system. Until a proper name is decided upon, the body is known only as 2012 VP113.According to the science journal Nature, the team that discovered it call it VP for short, or “Biden”, after US vice president Joe Biden. Its pink tinge comes from radiation damage that alters the make-up of frozen water, methane and carbon dioxide on the surface. Though exciting in its own right, the discovery raises a more tantalising prospect for many astronomers: that a “Super Earth” up to 10 times the mass of our planet orbits the sun at such a great distance that it has never been seen. Astronomers found 2012 VP113 by taking snapshots of the night sky an hour or so apart with an instrument called the Dark Energy Camera on the US National Optical Astronomy Observatory telescope in Chile. When they turned the images into a time-lapse movie of the sky, they could see the new body moving against the background of stationary stars. The object’s orbit brings it as close as 12bn kilometres from the sun, and swings out as far as 67bn kilometres. There are comets that come from even farther out, but they pass much closer to our home planet. The solar system has three distinct regions. Closest to the sun are the rocky planets, such as Venus, Earth and Mars. Farther out are the gas giants, such as Saturn and Jupiter. More distant still, beyond the orbit of Neptune, is a band of icy objects called the Kuiper belt. In 2003, astronomers found an object beyond the Kuiper belt, which they called Sedna. For more than a decade, the object was a loner, an anomaly in the solar system. But the new body, 2012 VP113, lurks in the same no-man’s land of space, leading astronomers to believe there could be thousands of similar bodies waiting to be discovered there. “People wondered if Sedna was unique, and 10 years on, we have at last found another object that shows it is not. There is probably a large population of objects out there,” Sheppard said. The region of space where Sedna and 2012 VP113 were found is called the inner Oort cloud. Astronomers are unsure how this remote cloud of objects formed, but there are three competing theories. One is that a rogue planet was flung out of the early solar system and dragged the Oort cloud material with it. Another is that the material was pulled out of the inner solar system by a passing star. The third option has the same job done by planets orbiting stars born in the same cluster as the sun. “What is exciting about this work is that we know the inner Oort cloud is there. This is the second object we know of, and it’s a smoking gun,” said Meg Schwamb, a planetary scientist at the Institute of Astronomy and Astrophysics at Academica Sinica in Taiwan. By studying the objects, astronomers hope to confirm how the inner Oort cloud formed. Sheppard found the new object, reported in Nature, with fellow astronomer, Chad Trujillo, who works at the Gemini Observatory in Hawaii. Trujillo was a co-discoverer of Sedna in 2003. The latest work has already thrown up an intriguing possibility. The angle of the body’s orbit and that of Sedna’s are strikingly similar, an effect most likely caused by the gravitational tug of another, unseen body. One possibility is a “Super Earth” that traces so large an orbit around the sun that it has never been seen. “If you took a Super Earth and put it a few hundred astronomical units out, the gravity could shepherd Sedna and this new object into the orbits they have,” said Sheppard. An astronomical unit (AU) is around 150m kilometres, or the mean distance from Earth to the sun. Earlier this month, Nasa’s Wide-Field Infrared Survey Explorer (Wise) reported the results from its search for “Planet X”, a hypothesised planet far out in the solar system. 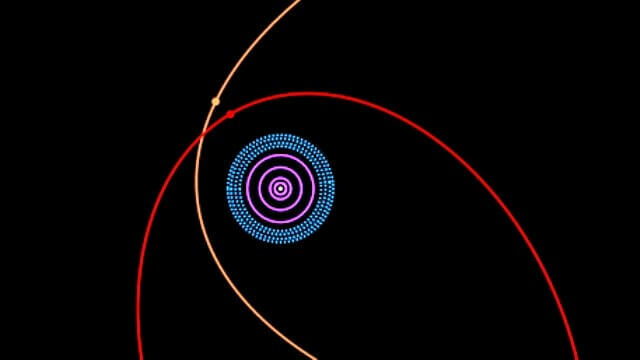 It found no evidence for a new planet larger than Saturn within 10,000 AU of the sun. But Saturn is 95 times more massive than Earth, so a smaller Super Earth could go undetected in that region.